In my wanderings this summer, I’m keeping my eye out for trees planted by water. I’m especially interested in their roots and reflections. I may use these studies for paintings. This entry was posted in Summer Diary and tagged Art, Augustana College, blog, drawing, faith, inspiration, Nature, painting, roots, slough, tree study. Bookmark the permalink. “Trees by the water” gives us much to think about. Trees away from the water must work harder to survive – they have to have a deeper root system as they seek the water; they are often alone because they are without the shade provided by others and without a source of nurturance. 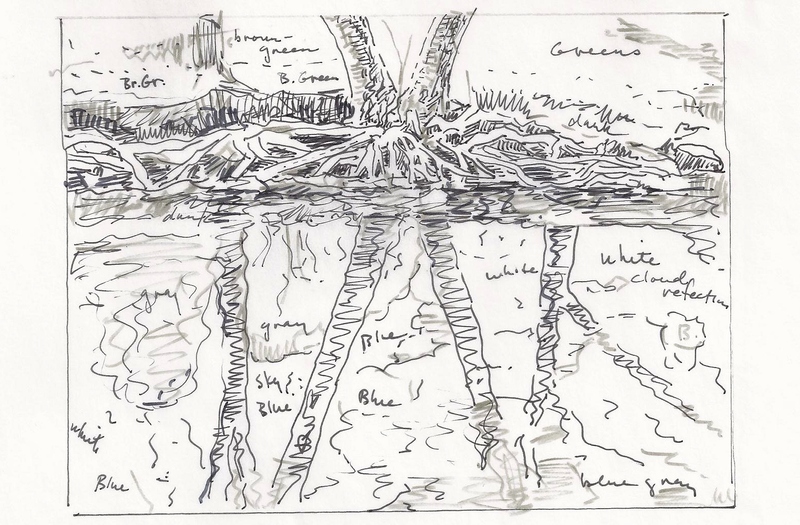 Carol D.
Jackie, Sara and I would like to use your drawing of “Trees by the water” for the cover of our healing service tomorrow. We are asking for your permission. If yes, could you please send it to one of us? We will be printing bulletins tomorrow late morning. Thank you! Praying that you are doing well. Heidi, I replied to Sara earlier. Best wishes with the healing service…connecting nature and healing is a great idea.